There are some amazing kitchen gadgets in the world, but it can be hard to know what exactly someone already has and what would be appreciated, and not just something that it taking up space in their kitchen. This list is most cosmetic stuff because when in doubt, pick the pretty option. There are also kitchen spices thrown in for adventure. Homemade Infused Herb Vinegar’s. Found here. I thought this was a great gift idea for the foodie or cook in your life. This DIY doesn’t take a lot of talent (bonus! ), but it sounds like a delicious hit. Perfect gift for the adventurous cook or someone looking to expand their horizon. 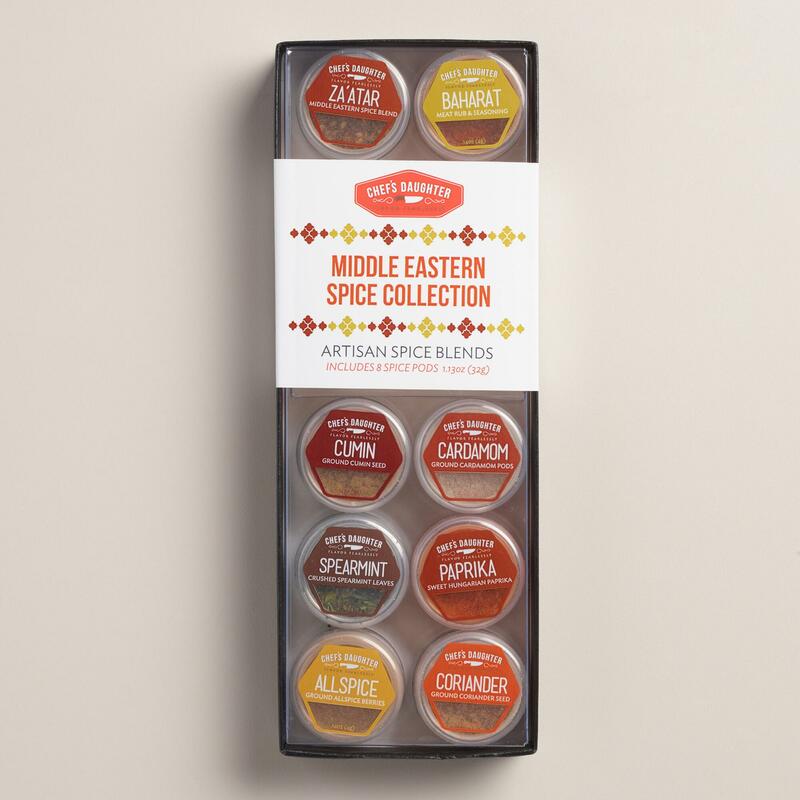 Middle Eastern Spice Variety Pack, World Market, $14.99.But seriously, spices are expensive which can be a drag when trying to teach yourself a new cuisine. Plus, this gift can be totally self serving in that now your friend really should invite you over for dinner. 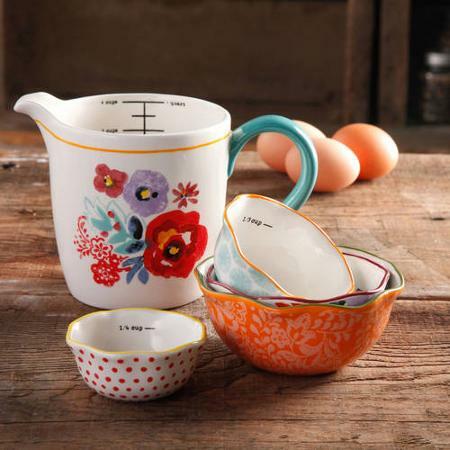 The Pioneer Woman Flea Market 5-Piece Prep Set, 4-Piece Measuring Bowls with 4-cup Measuring Cup, Walmart, $14.86. This looks remarkably like my measuring pitcher from Anthropologie. But cheaper. Not that you’re cheap. But there is only so much money to go around. For the baker in your friend group, think of gifting them with this adorable cookie stamp from Anthropology, $14.00. 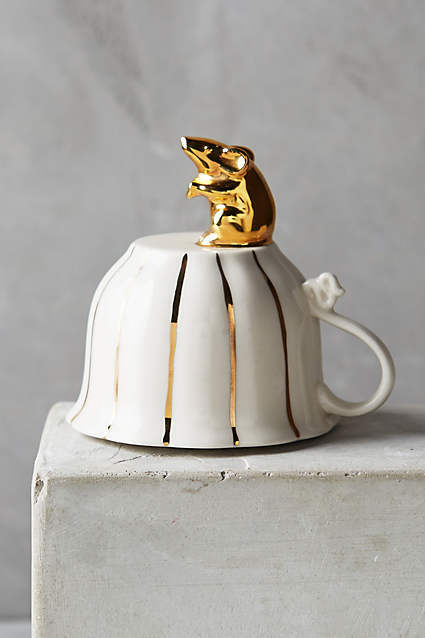 The gilded mouse on the tea cup is so stinking cute and a cookie press is a thoughtful hobby related gift, without risking buying them a gadget they already have. 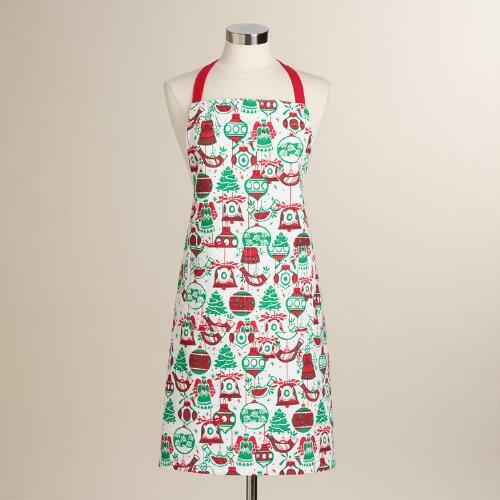 Or gift them this red and green Ornament Apron, World Market, $14.99. Very few people cook with an apron, at least that I know, but it totally is a worthwhile endeavor because changing clothes to cook is already too much effort. And I can’t afford to grease up any more sweatpants. 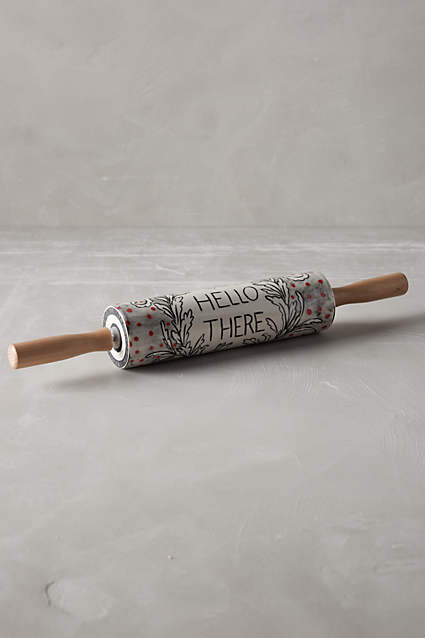 Anthropology crowned leaf bakewear rolling pin, $18.00, I have a rolling pin. Most cooks have a rolling pin. They probably do not have a rolling pin that is pretty enough to be a decoration and a kitchen tool. It also says hi. There is just a lack of friendly kitchen tools in the world, really. 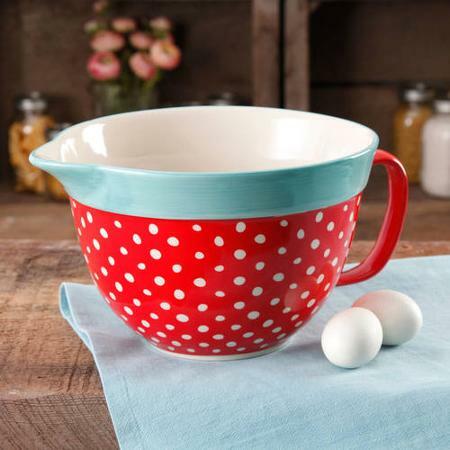 The Pioneer Woman Flea Market 2.83-Quart Batter Bowl with Decal, Red Polkadot, Walmart, $18.82. The Pioneer Woman’s flea market finds are adorable. This would be a good gift on its own or spruced up with a waffle dish towel, a spatula, a whisk, and a mix of holiday cookie dough. Bialetti 6799 Moka Express 3-Cup Stovetop Espresso Maker Amazon, $24.98. This one is actually on my Christmas list. Coffee is so trendy right now (as it should always be! ), but a lot of people still lack a way to make expresso. This kitchen accessory takes brunch to a whole new level, is delightfully European, and is the perfect gift for your home cook. Plus, you know what you can do with a shot of expresso? Make a pumpkin spice latte!! If you are looking for something less corporate, might I recommend Colonel De’s . This is one of Z. and I’s must hit places when we are in Cincinnati. It was recommended to us by this lovely couple we met one evening and since then has been a favorite. We can spend forever just looking around and smelling all the spices. Gift sets can range from the $20 Salt of the Earth sampler to the $50 Around the World or Baker’s Tin set. They also sell a wonderful For Starters gift box for $35, a great gift the new cook. Previous Post Hey there Classy lady, Wanna Present?